Oh my, do I ever have a treat for you today! 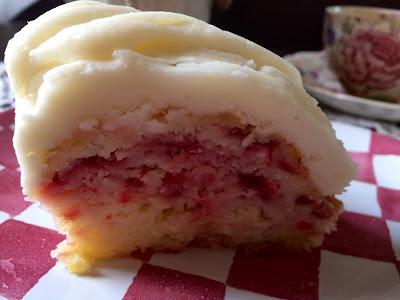 Have you ever tried Nothing Bundt Cake's White Chocolate Raspberry cake? It is my favorite flavor! Last year my bloggy buddy, Jenna, from The Painted Apron made a version, and I have been dreaming about it ever since. You can see Jenna's cake here. Jenna is such a great cook and a wonderful artist. I actually made the cake for our ladies luncheon that we have every month, and it was a hit. Here's the cake ready to bake in my pretty NordicWare Heart Bundt pan. Look at the inside of the cake...heaven, I tell you! This cake is so heavenly if you love raspberries! Grease and flour a bundt pan (I like to use Baker's Joy to get in all the crevices), and preheat your oven to 350 degrees. Mix first six ingredients together with a beater. Fold in white chocolate chips. Fill prepared bundt pan with half of the batter. Spoon half of the raspberry filling in small, separated spoonfuls over the batter, and swirl. Pour remaining batter in evenly and spoon in remaining pie filling, repeating the swirling process. Cook in oven at 350 degrees for 45-50 mins, or until a knife inserted comes out clean. Remove from oven. Let cool for 20 mins. Remove from pan, and let cool on a cooling rack. This will take awhile to completely cool. In a medium bowl, cream together the cream cheese and butter until creamy. Mix in the vanilla, then gradually beat in the powdered sugar, starting with 2 cups, then add the other 1/2 cup, until it is thick. Frost the cake (See note). To get the ribbon effect of the frosting, use a piping bag OR fill a gallon food safe bag with the cream cheese frosting, and twist the top. Cut a corner off of the bag, and squeeze the icing onto the cake. What to do with the extra pie filling? You can make a half recipe of  these Raspberry Crumble Bars. 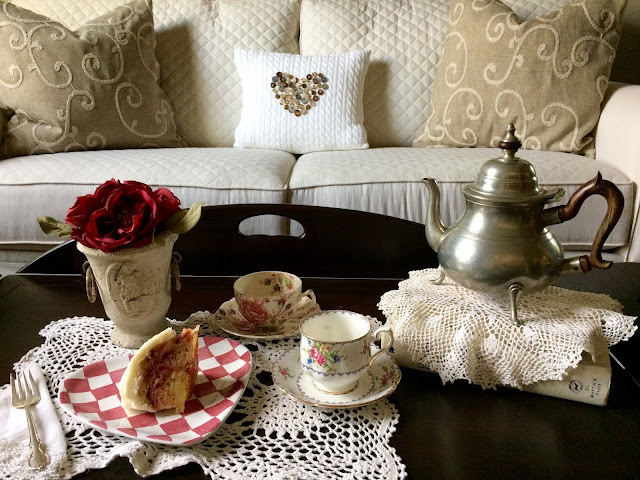 My bloggy buddy, Lauren, at My Wonderfully Made Blog recently made the cutest chenille Valentine decorations, and Cissy and I made them from Lauren's inspiration. They were such fun to make. 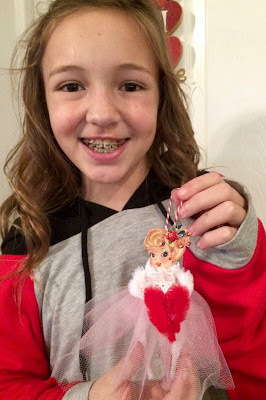 You can check out Lauren's darling ones and her valentine tree by checking here. My version is here. Cissy gathered the tulle with needle and thread and she fashioned the hearts to surprise me out of some of the bump chenille. The cake looks delicious and pretty!Your table is elegant as ever with gorgeous silver teapot and beautiful teacups...Of course,I love those precious doilies too!The Valentine girls are cute and creative.Blessings to Cissy and you! Yum Kitty! I'd love a slice of your beautiful cake this afternoon with a cuppa as a pick me up! Cissy's chenille Valentine decorations are darling...love her smile! Are her braces new? Cissy made an adorable Valentine decoration. Oh that cake is perfect for this time of year...a true Valentine's delight! Oh Kitty Thank you!! That is my very favorite cake, I must make it this month too! 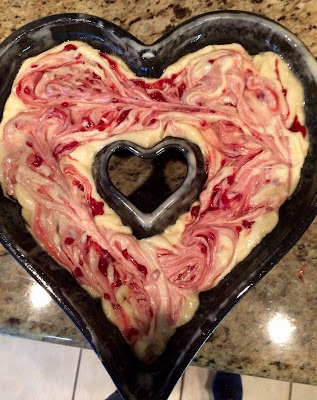 So glad it was a hit, and how cute in that heart bundt pan! Cissy's creations are so so cute, she looks like such a little sweetheart! Kitty, oh my... that bundt cake looks so tempting! And I love your heart shaped bundt pan! I will bookmark this cake and when I am able to, I am going to make it (regular bundt pan though). And Cissy looks so proud of her sweet Valentine decoration! Great job!! Your bundt cake looks amazing, Kitty! I'm intrigued by the white chocolate and raspberry combo. Your Valentine crafts made me smile. I just put up my Valentine decor yesterday. Oh this sounds delicious! A perfect flavor combination. The Valentine's day decoration is adorable. I love the vintage vibe. This cake looks amazing! The way you did the icing, it made me think of a ruffly lace topping. SO pretty to look at, and I can only imagine how delicious it tastes! I don't think it would last long around our house. :) God bless you, sweet friend. Oh my, what a beautiful looking cake. White chocolate and raspberries go together so well. I think this might be a Valentine's treat! Just the name makes me drool. Sounds so good, I saved this and may make it for valentine Day Tea. Yikes this looks amazing!! I’m definitely going to try this. I’m hosting our Bible study group on Sunday so I think I’ll make this! Thanks for the shout out about the ornaments:). Glad you gals had fun making them! Hi Kitty, your cake looks so good and yummy. It’s so awesome getting inspired by our blog friends. Thanks for sharing at Cooking and Crafting with J&J. Enjoy the week. OOO...this cake sounds and looks amazing. I will save the recipe and make it soon. Your darling grandgirl looks so cute, holding her ornament. That cake makes my mouth water looking at it with all that beautiful ribbon icing, Kitty! And those little decorations are adorable! I love how we share the inspiration around blogging, what a great community. Cissy's getting a real jump ahead with her knowledge base! Okay, I have never heard of Nothing Bundt Cake, but a store is opening this spring in my area, so I'm guessing I had better try it, right? Meanwhile, this version looks scrumptious! PS So glad you got to come to the tour. Sorry i missed you but I didn't stay. It kinda creeps me out to hear people comment on my home. The cake looks lovely and delicious. Thank you for sharing the recipe! I'll be pinning this one, Kitty! I do love raspberries and your cake looks fabulous! This looks absolutely delicious!!! Thank you for sharing and the presentation is just beautiful! Enjoy the rest of your weekend! 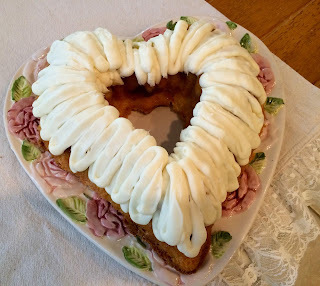 This is a beautiful Bundt Cake that we will just love this is a great recipe! Hope you have a great Valentine Week and thanks so much for sharing with us at Full Plate Thursday! Oh Kitty, this looks divine! Your recipes and treats always make my mouth water :) And I love that you and Cissy made some Valentine decorations...they are darling. Also, your chocolate covered oreos look mmmm....mmmm....good! Maybe my son and I should make some :) Thinking of you and wishing you a beautiful and warm day. Love and hugs! Oh Kitty, that cake looks wonderful and slightly decadent!! :D It looks so beautiful in all your pictures, and I can see why it was a hit with the ladies. I've already pinned this recipe, my friend. ;) Those Valentine decorations are sooo pretty; I'm headed over to that website to see how to make them. 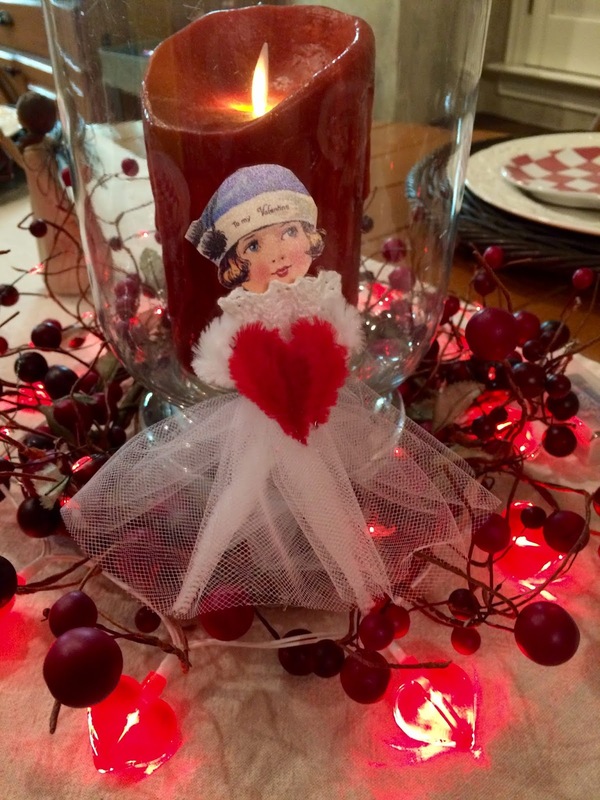 Thanks for sharing the recipe and the pretty Valentine decs, Kitty! Happy Valentine's to you! !